Get Direct Admission In SRM University, Chennai through management quota, for Engineering, Medical and Management Courses. We will provide you complete admission guidance for Direct admission in B.Tech, B.Arch B.Design, M.Tech, MBBS, Nursing, Pharmacy, BBA, MBA programs. If you want to take direct Admission In SRM University, Chennai ( UG and PG Degree Courses) then you are in the right place to get admission guidance. All these universities are established recently for Engineering admission. Altogether SRM has established 7 engineering campus from North to South India. Most of its campuses are new and still, the 1st batch of engineering students have still not completed the final year. Demand for Srm College, Chennai campus among engineering aspirants are quite high because of the reputation of the college. More than one lakh application forms are applied every year for SRM joint entrance exams for admission in SRM group of colleges. 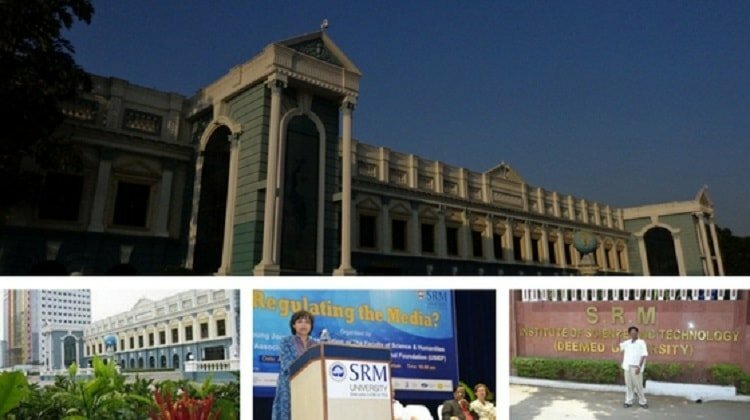 Admission In SRM College, Chennai is only possible if you have successfully completed your 12th degree for UG courses admission and bachelor degree for PG courses admission. Direct Admission to SRM University of Engineering only after you have cleared your class 12th with an average score of 60% together in PCM ( Physics, Chemistry, Mathematics). Admission to SRM University Engineering College through management quota seats or institutional quota seats are available if you are willing to pay extra tuition fees per year more than normal fees. SRM University is for students who can afford to pay a high per annum fees to the college for admission in B.Tech, B.Design, B.Arch, and M.Tech. For Admission In B.Tech Srm University Chennai campus, it is compulsory to apply for the SRMJEEE entrance test and write the online entrance test. For SRM Delhi, Haryana, Sikkim campus you can also get admission on JEE mains score or class 12th entrance exams. Online portal for admission in SRM college is opening form the month of March and students can easily book their slots to take up entrance test. If you appear for the exams then you can apply for management quota seats for admission in SRM college 1st campus and the 2nd campus located in Chennai. For students scoring below cut-off marks in entrance exams and still looking for admission in SRM university can consult admission consultancy for guidance. Most of you who can not effort to pay high fees per year to the college are requested to take up the SRMJEEE entrance exams for B.Tech Admission in SRM college, Chennai, and other campuses. SRM University charges high tuition fees for admissions in B.tech if you have not qualified the cut-off score in SRMJEEE online exam. For Direct Admission in SRM University, you don’t need to pay donation or development fees for admission. SRM college and Vit University are charging management quota high tuition fees for 4 years b.tech program. SRM has Students from other countries like Nepal, Srilanka, Bhutan, African and Gulf Countries. SRMJEEE Entrance exams for Engineering course Admission in Srm college. Application form for SRMJEEE 2018 entrance will be announced in January. Online entrance exams will be conducted in the month of June and you need to book your slot for entrance exams prior to the exams. Application forms will be available on SRM college official website. Engineering is your age must be 16 years old or more. You should have 50% marks in class 12th board examinations in PCM (Physics, Chemistry, Maths). To apply for B.tech in Genetic Engineering, Biotechnology Engineering and Biomedical Engineering program 50% total mark either in PCM or PCB (Physics, Chemistry, Biology). The criteria for admission to SRM university is based on the counseling on your rank scored in the SRMJEEE entrance exams. Depending on your rank score and 12th percentage you will get Admission in SRM Colleges. Apply for NATA (National Aptitude Test In Architecture) Entrance Exams if you want Bachelor of Architecture Course at SRM University. No Entrance exams will be conducted for B.Arch courses however you need to apply to SRM official website for counseling through NATA score. SRM B.Tech/ B.Arch/ B.Design Admission after SRMJEEE exams through leftover seats from counseling in a low budget package. Canceled and returned seats are left which anyone can join if applied for the entrance exams with the help of consultancy. SRM Hostel fees for without AC Sharing room cost is starting from Rs 35,000 for Boys and Girls. SRM Hostel fees for AC Sharing room cost is starting from Rs 1,25,000 for Boys and Girls. For Mess extra Rs 53,000 per year will be charged for Breakfast, Lunch & Dinner. Almost all of the engineering branches are available in all four SRM Campuses. SRM has recently launched it’s SRM Amravati, Haryana, NCR, and Sikkim campus to accommodate more engineering aspirants. It has started with only major four branches of Engineering. You will get Direct Admission in SRM college Amravati, Delhi, Haryana, and Sikkim campus based on your 12th results and SRMJEEE or JEE Mains Entrance Exams Scorecard. Contact for SRM Direct Admission in All campuses 2018 – 19 Batch guidance and support. For Direct Admission in SRM University, the minimum eligibility criteria are 12TH 60% marks in PCM Science & appear for SRMJEEE Entrance. I need direct admission to SRM main campus this year . How to contact . THANKS FOR CONTACTING US FOR ADMISSION ASSISTANCE. I Require seat in SRM main branch in B tech CSE, under Management Quota. Please inform me the total amount and procedure. 60% Marks in PCM 12TH & SRMJEEE written is must for admission in SRM. Can I get ECE branch or CSE in SRM University campus? I got 38,462 ranks in SRMJEE. I want to change my campus and branch from Ramapuram campus to the main campus. Is it possible? I need a direct admission in SRM Amaravati in BTech (CSE) branch. I want to take admission in B.Tech through management quota. I have 49% can I get a seat for B.Com? I want admission for b. Tech in Delhi NCR campus. I had qualified the entrance Srmjeee but did not go for counseling, so can I still get admissions on the bases of Srmjeee? You can ask the same with the SRM NCR College admission authorities, I think they will give you a seat on basis of SRM JEE entrance score. whether students not attending SRMJEE can take direct admission for SRM colleges for Bsc Agriculture or Biotechnogly engineering UG course in management quota? Very detailed and useful post! this will surely help those who looking for the Best Engineering Colleges in Chennai. I want a management quota for the admission of the aerospace or biomedical engineering. what will be the fees structure? Hi BALA, Fee is 2 lakh per annum in SRM, Ramapuram Campus, Chennai. Contact 8546881677 to book your seat in SRM Institute of Technology.